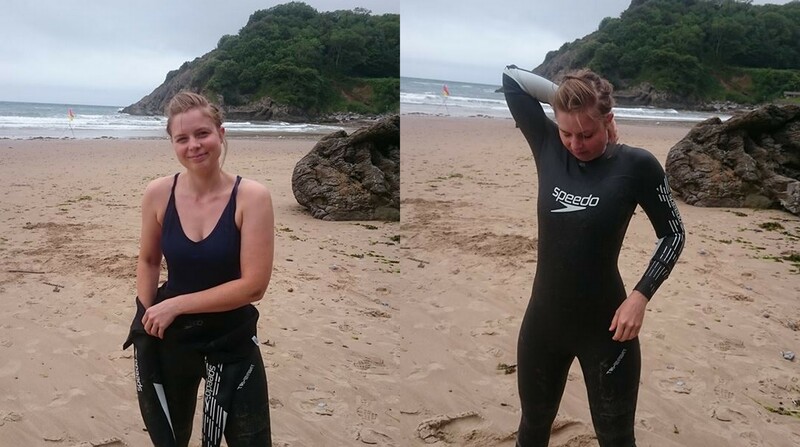 Weekend Away at Caswell Bay (You Should Visit) – Ride. Write. Repeat. I’ve got an entire day to sit on my bum and tap it out today – and I don’t mean in that “tappa-tappa-tappa” climbing up the Surrey Hills sort of way. Our decision to buy a character-full-1930s house 18-months ago means we’ve got electricians ripping out its guts today and tomorrow – so I can’t leave the vicinity, or actually use anything in the house. Result = writing to the Libertines and The Jam in the garden. An expensive way to get a lazy day, but perfect. Last weekend my husband and I celebrated our first wedding anniversary. In the style of a couple who found love touring and road tripping, a weekend somewhere with plenty of access to the outdoors was all we wanted. 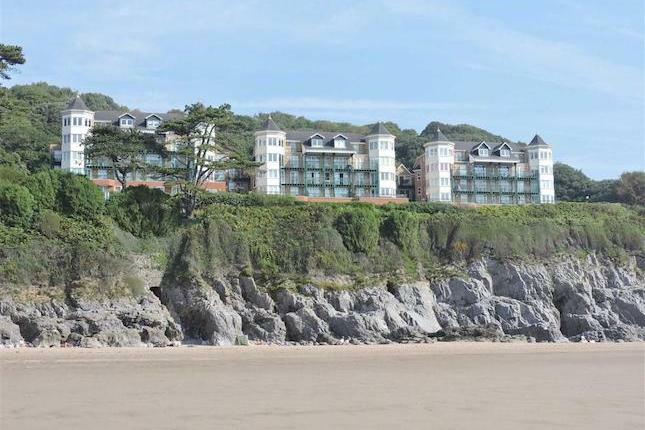 Luckily for the pair of us, my uncle and his wife own a stunning flat that sits directly opposite the award winning South West coast beach, Caswell Bay. 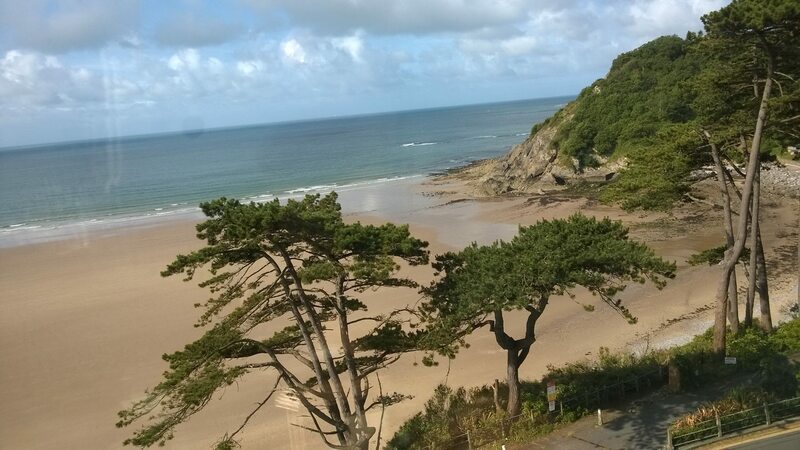 Just a couple of miles from the Mumbles, and not far from Swansea, Caswell Bay is basically its own private island of tranquility – the only disturbance is the daily visit from crashing waves that draw in hordes of happy surfers. The break was called for, it had been a busy week of transformation at work, which was only set to become more all-consuming the following week. Not bad transformation, just going-to-require-more-brain-space change. We loaded the car, leaving at 8pm when the busy rush hour had long since ebbed. We arrived at around midnight, after a short stop for Starbucks (me) and KFC (him). The flat treads the perfect line between comfortable and luxurious – the carpets are white and the windows are wide, revealing panoramic views of the seaside – yet the sofas are sink-into-me comfortable and every amenity from plasters to toothpaste is ready and waiting, donations from whichever family member last visited. Directly over the road, is the beach, and the sea. The seaside air doesn’t just mean salt and the calls of seagulls. I’ve yet to find a town with a beach that is not more relaxed than beachless settlements – there’s something about seeing the edge of land that seems to just cause people to breathe out, and relax every muscle. People are always more happily active, too – but why wouldn’t you be with rock climbing in your garden and a pool that’s open all hours? On Saturday morning, we trundled to the town for breakfast, then returned to the flat to prepare for a quick ride. Riding on the Gower is always a little bit of a question. 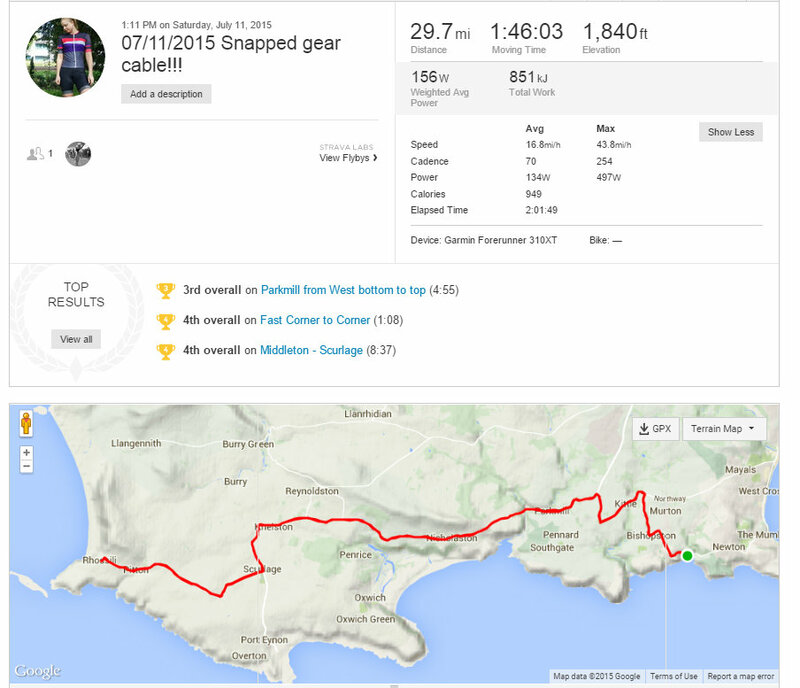 There’s an undulating network of roads that take us out to Rhossili, but it’s only around 15 miles each way, resulting in a 30 mile ride which has its fair share of climbs, but isn’t very far-reaching. The profile is always less impressive than it feels on the way – probably because none of the climbs are long or steep, but the terrain just goes up and down, and never seems to flatten. There is, of course, plenty more riding to be found in South Wales – but on our ‘time to relax’ weekends, neither of us is usually that excited about negotiating the busy roads that lead to Swansea. One year, we’ll plan it and do an epic ride, but as it stands, we tent to stick to our short bimble. The bimble was a little complicated this time. Eight miles in, I flicked my right shifter to take the chain down the cassette for a smaller gear. Clatter. Not good. I flicked again, this time up. More clatter, and a sudden feeling that the shifter was attached to thin air alone. A cable hanging from the downtube is never a good sign – especially not on a ride up and down the green and illustrious hills of Wales. We arrived at the conclusion that there were no bike shops nearby, and I was stuck with a choice between the 52/11 and the 36/11 gear. I smiled (I expect wryly, though I personally cannot say) and clipped in to continue the journey. Maurice (I expect, looking surprised, though I couldn’t see) shouted “where are you going? Aren’t we going back?” With just a few weeks to go until my scary 100 mile time trial, I wasn’t swapping 30 miles for 16 miles. Since he wasn’t going to be the one stomping the pedals up the upcoming hills, he said ok, and off we went. The remainder of the ride was just as beautiful as it would have been with more gears – just a little complicated by my need to spin excessively at some points, and heave my entire body from side to side to get back up the ramps in the road – but the views of the sea as we approached Rhossilli where well worth the grunting, and I was pleased we’d continued the journey. Thankfully, we turned back around into an enthusiastic tailwind to counter the backward blowing we’d had on the way out. Brennan commented that though I was weaving around a bit, I seemed to be climbing faster without the option of smaller gears – it must be all that practice time trialling at 69 rpm. Arriving back at the flat, I plunged briefly into the sea and then set about creating a feast of champagne and steak – the perfect combination, I hope you’ll agree. There are tons of restruants in town, a family favourite being Verdi’s – but we just fancied making the most of the luxury apartment. 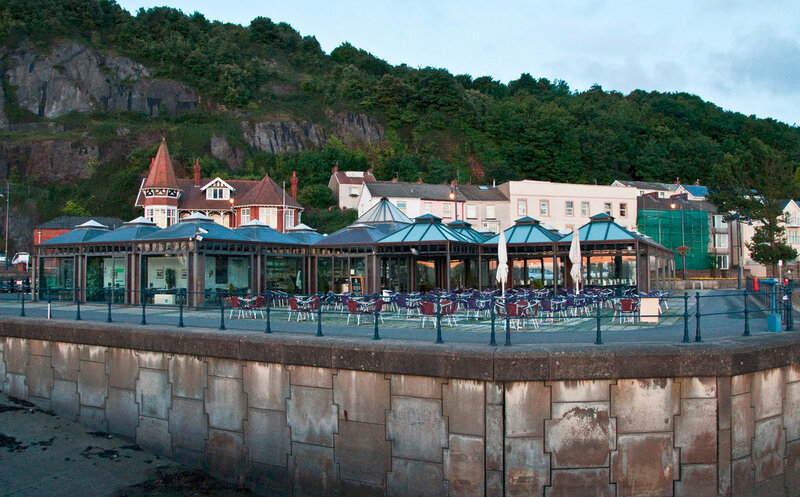 Sunday was a day for more leisurely breakfast, followed by leisurely coffee, and leisurely wondering around Fat Face – one of few shops open in the Mumbles on a Sunday. We grabbed lunch at the Surfside Café – a slap up anniversary meal that hit the spot better than any restaurant delicacy. My plans for Sunday included much swimming. When the tide came in, I suited up in my new favourite Speedo gear, and sauntered down the pebbles to explore the new watery playground that had filled the bay. I don’t swim in the sea that often – or really at all, previously I’ve always managed a quick few strokes, then given up with the mouthfuls of salty water and the dizziness from being thrown up and down, but having had one dip in Brighton a few weekends ago, I wanted another go at “properly swimming” in the sea. The surfers had taken up their positions and were bobbing around near the bay, so I went a little further out to limit the likelihood of being paddled into. The plan was to swim to the next bay. However, with the wind up and the waves crashing in towards the bay, I couldn’t help but notice I was repeatedly swimming into swarms of white entities. I’d assumed they were some sort of plant life, the little ones looked much like balls of fluff. But every so often I’d discover a larger swarm, and notice they were pulsing slightly and looked distinctly alive – with little red networks like buzzing electricity cables inside their white masses. Every time I discovered a new nest of jellyfish, I’d start to smash my hands into the water and kick ferociously – the thinking being that if I disturbed the water enough, they’d flow away from my body before I touched them. However, quite a few bumped into my hands and feet, like wet marshmellows – and one smashed into my nose, much to my surprise. 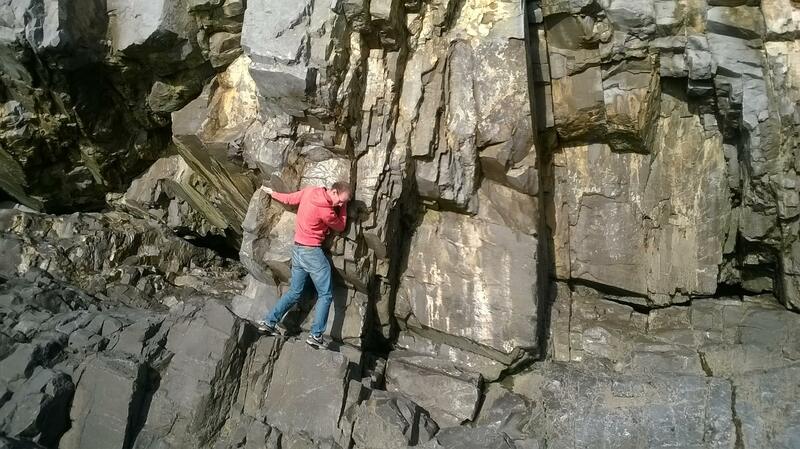 No pain ensued, so I carried on until I spotted a surfer who looked friendly and approachable. Long story short, I continued to swim up and down the bay – but decided to stay in the area around the lifeguards, and to scrap the “next bay” plan – since that meant going much deeper to get around the rocks, and it seemed clear that the further out I want, the bigger the jellyfish were. I swam for about an hour, not too bad since sea swimming on a wavy day is fairly strenuous, and noticed when I got out that the bay was covered in jelly-bodies. Maurice, reading his book, came down to inspect, and we wondered on the lifespan of a jellyfish. Perhaps not that long, many being washed up before they were even large enough to develop the electric wire-insides that their older siblings had successfully internally sprouted. We spent the rest of the afternoon chilling, reading, before restoring the flat to its state as it were when we arrived, and packing up. A wonderful weekend – and one of the best beaches in the world – as long as you’re not a jellyfish. I know the Gower well, and I have to say that I’d be very, very cautious before swimming around any of the headlands there. We get big tides in the Bristol Channel, and at certain times of the day you can get some viciously dangerous currents when the sea is forced to change direction as it swirls around a headland. Next time you’re in Caswell, check with the lifeguards before you try to swim to the next bay or the local newspapers might be carrying a horrible story about your untimely demise. If you’re a regular there, I’m sure you know about the currents, but your readers might not be so well informed.